Joseph Viscomi is the James G. Kenan Distinguished Professor of English and Comparative Literature at the University of North Carolina at Chapel Hill. He coedits the William Blake Archive with Morris Eaves and Robert N. Essick, with whom he also coedited volumes 3 and 5 (1993) of the Blake Trust’s William Blake’s Illuminated Books. He is the author of Prints by Blake and His Followers (1983), Blake and the Idea of the Book (1993), and numerous essays on Blake’s illuminated printing, color printing, and mid-nineteenth century market and reputation. Karen Mulhallen (karenmulhallen@rogers.com) is professor of English at Ryerson University and at the University of Toronto, as well as professor in the Joint Graduate Programme in Communication and Culture at Ryerson and York Universities. After many decades of thoughts by day, she has returned to her earlier work in night thinking and is now completing a critical study of the whole composite Blake-Young Night Thoughts series. Elizabeth B. Bentley has worked on Blake with her husband in libraries around the world; she specializes in research on long-lost (sometimes still lost) works, including The Ladies New and Polite Pocket Memorandum-Book (1782), The First Book of Urizen (E), “The Ancient Britons,” and Blake’s Grave watercolors. M. Crosby (mark.crosby@university-college.oxford.ac.uk) is just completing his DPhil at Oxford on the three-year period Blake spent in Felpham under the patronage of William Hayley. Blake/An Illustrated Quarterly is published under the sponsorship of the Department of English, University of Rochester. Subscriptions are $60 for institutions, $30 for individuals. All subscriptions are by the volume (1 year, 4 issues) and begin with the summer issue. Subscription payments received after the summer issue will be applied to the current volume. Addresses outside the US, Canada, and Mexico require a $15 per volume postal surcharge for surface delivery, or $20 for airmail. Credit card payment is available. Make checks payable to Blake/An Illustrated Quarterly. Address all subscription orders and related communications to Sarah Jones, Blake, Department of English, University of Rochester, Rochester NY 14627-0451. Back issues are available; address Sarah Jones for information on issues and prices, or consult the web site. Manuscripts are welcome in either hard copy or electronic form. Send two copies, typed and documented according to forms suggested in the MLA Style Manual, and with pages numbered, to either of the editors. No articles will be returned unless accompanied by a stamped self-addressed envelope. For electronic submissions, you may send a disk, or send your article as an attachment to an email message; please number the pages of electronic submissions. The preferred file format is RTF; other formats are usually acceptable. International Standard Serial Number: 0160-628x. 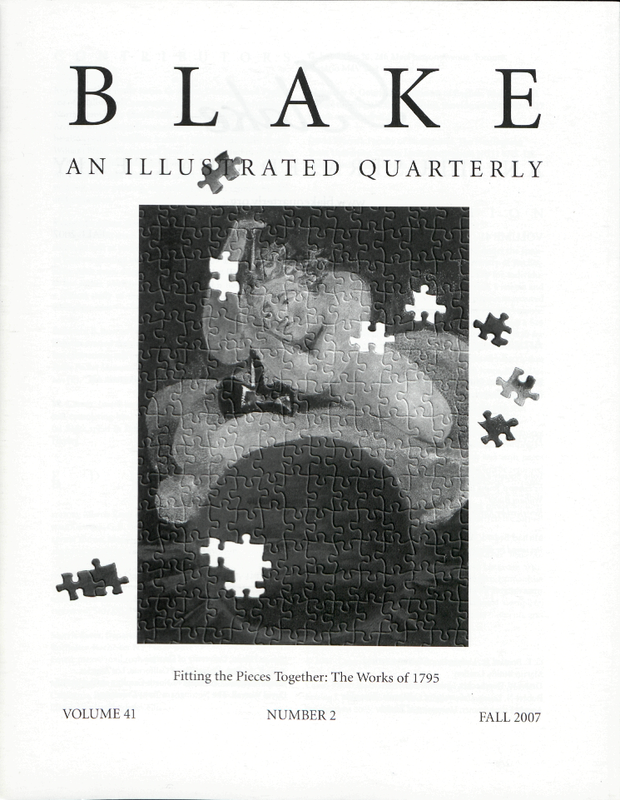 Blake/An Illustrated Quarterly is indexed in the Modern Language Association’s International Bibliography, the Modern Humanities Research Association’s Annual Bibliography of English Language and Literature, Humanities International Complete, Arts and Humanities Citation Index, Current Contents and the Bibliography of the History of Art. Cover: Photo illustration from The Song of Los copy B, plate 8. Lessing J. Rosenwald Collection, Library of Congress. © Copyright 2005, William Blake Archive.